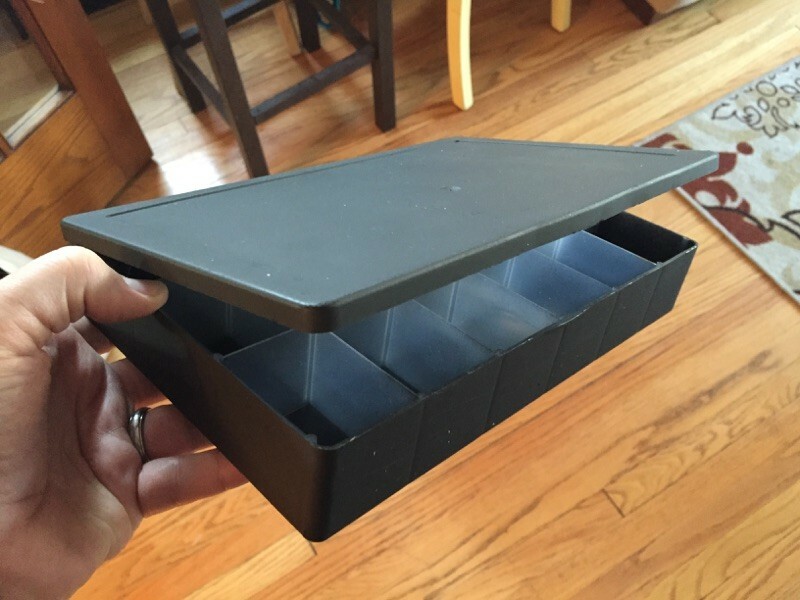 Anyone who has amassed a large collection of RPG or tabletop miniatures has spent some time looking at Battle Foam, Feldherr and other carrying cases. When you’ve logged hours and days collecting minis and/or painting them, you want to protect your investment. The aforementioned manufacturers are pretty great, but you also can save a lot of money by making your own case. 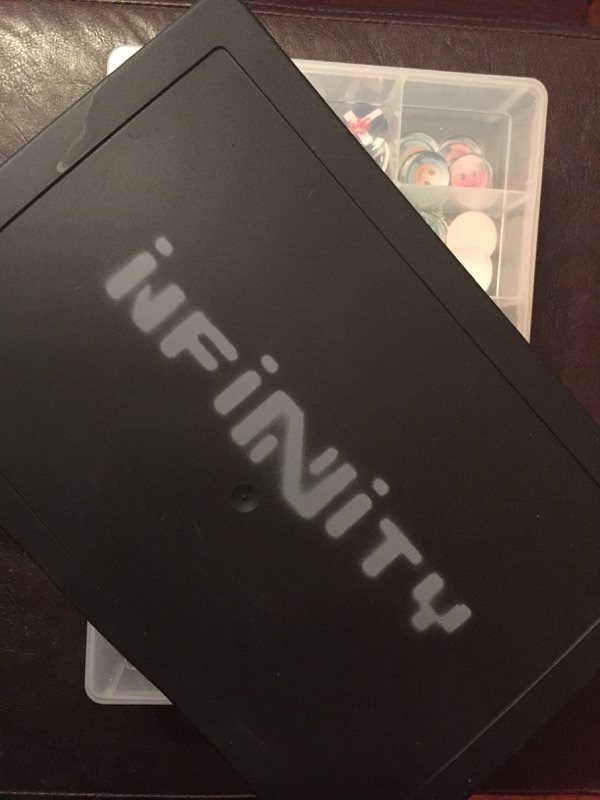 It’s really easy, really inexpensive and you can customize the case any way you want. 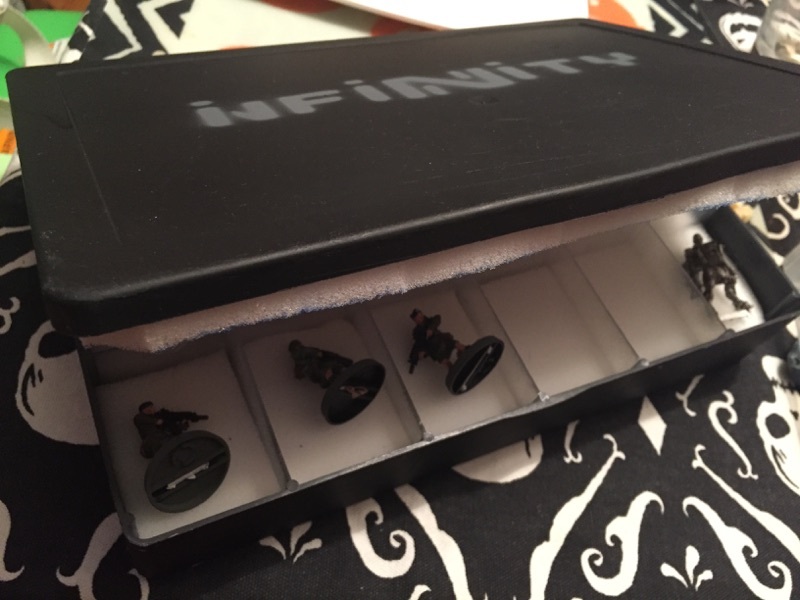 For my burgeoning Infinity collection, I wanted a small case for about 15-20 models. So I made my own. This was a really inexpensive project and it was really, really easy to do. With an hour and a little more than $10 (no joke), I had a pretty awesome custom case. It’s pretty dang secure, too. My son knocked the case on the floor from the kitchen table, and my minis stayed intact. Hooray! 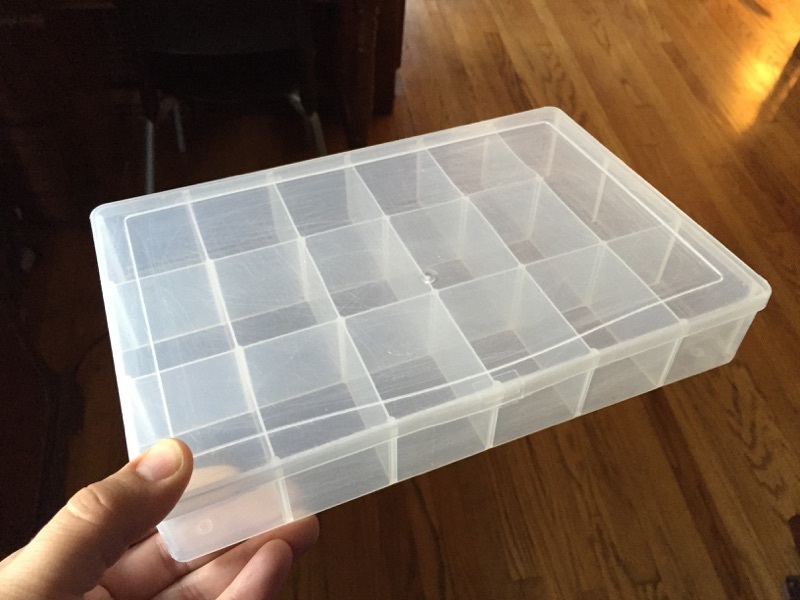 Plastic jewelry case: These are available at craft stores for a few dollars. I got mine at Michael’s for $2.99. Soft foam: Available at most fabric stores. I found a pack of four sheets for $5 at Walmart. Mine was 1 inch thick. You’ll need something thick enough to fill most of the depth in the pockets of your case. 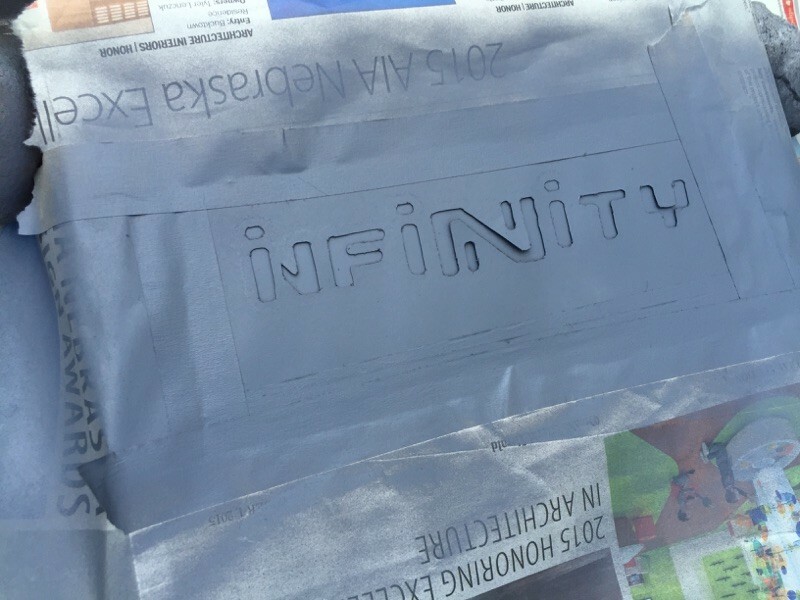 Primer spray paint. Any color you want. About $3 to $4 per can. My jewelry case was a glossy, clear plastic. To get the primer to adhere better, I took a fine grit sandpaper to the outside and roughed it up a little bit. Basically, take the sandpaper and rub it all around the outside of the jewelry case. I opened the case and laid it on some some newspaper spread on my driveway. Then I sprayed the primer in even streaks until the case outside was covered. I let the paint dry and checked it out. I missed a couple spots, so I put it back down and sprayed again. After the paint was dry, I brought the case back inside. 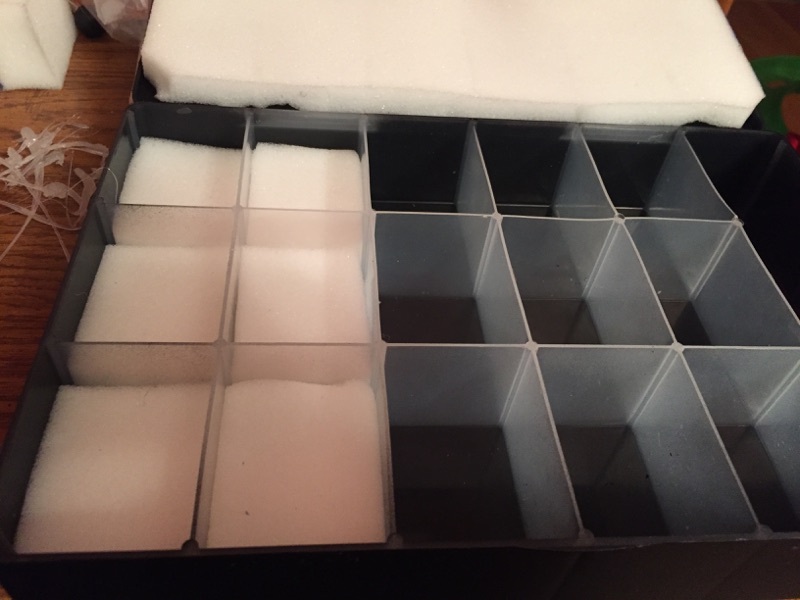 The inside of my case is divided into several rectangular slots, so I measured them out. Using a ruler, I drew lines on the soft foam and cut out little foam rectangles with craft scissors. 4. Heat up that glue gun. Dab a bit of glue in a pocket inside the case. Put in a piece of foam and press down to make sure the foam sticks. Repeat until all the holes are filled. Depending on what kind of foam you get, this can be the trickiest step. The top of the case also needs some foam, but it has to be thin enough to let the case close. The only foam I could find was perfect to place in the pockets but too thick to close the case. I had to cut the thickness in half, so I made cut after cut after cut down a center line until I had two sheets that were ½-inch thick. It took a few minutes, but it worked great. 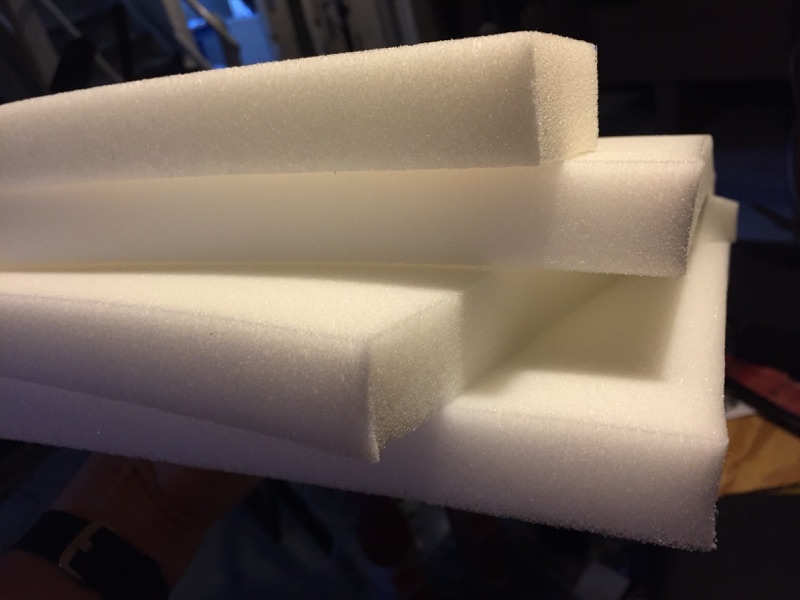 You can avoid all the cutting on this step if you buy two sets of foam: One thick for the pockets and one thin for the top. Measure out your thin foam to fit the top of the case. Cut that out and hot glue it to the inside top of the case. Optional steps: Your foam case is done now, but you can do a few more things to make it even better. With a simple stencil, you can put about anything you want on the case: Your name, an image, a logo, etc. You just need a second color of spray paint and a stencil. Using an Xacto knife, I cut the letters out of the sheet. Then I used masking tape to attach my new stencil onto the top of the case. I used more tape and newspaper to mask off the rest of the case. I picked a grey primer that would offset the black paint on the case. Same as before, I sprayed in nice even strokes until the stencil was filled in. I made sure everything looked good and then peeled off the stencil. I spray all of my minis with Testor’s dullcote clear coat to make sure they don’t chip. Even though the case is unlikely to chip or wear too much, I gave it a good coat of the dullcote as well. 8. All done. Put your minis in the case and enjoy how secure they are.